MusicCast allows you to access your digital music library, streaming music services and Internet radio, as well as Bluetooth® sources, your TV sound and external sources attached to your AV receiver, such as a Blu-ray Disc™ or CD player. The RX-S601 is only 4-3/8” high and 12-7/8” deep. It will fit nicely in narrow AV racks without jutting out from the front. This makes it easy to place your system where you want it and gives it a neat appearance. This unit supports the latest HDMI® standards thanks to the transmission of 4K video at 60 frames per second (pass-through only). Fully enjoy the high definition video quality of 4K without degradation along with HDCP 2.2 that fully complies with the latest copyright protection, a standard for 4K video transmission. The RX-S601 supports 3D video signals. Additionally, the Audio Return Channel function enables audio to be sent and received via the same HDMI cable, so you can hear the sound from the TV via a single HDMI cable. This AV receiver provides a variety of network functions that enable you to access more sources and also enhance operation. You can connect the AV receiver to a Mac® or PC with WebBrowser Control and have two way control of Internet radio, Pandora® and Spotify. The AV Controller App (from iTunes® or Google Play) lets you control various functions from your iPod®, iPhone®, iPad® or Android™ phones / tablets. This AV receiver supports AirPlay, which means they can accept wireless music streaming from iPod touch®, iPhone®, iPad®, as well as from iTunes® on a Mac® or PC. 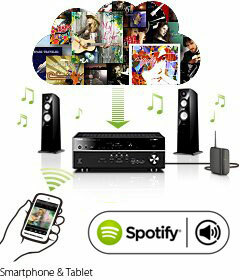 This makes it easy to enjoy music from your mobile devices or computer at your home theater system. You can view metadata such as song title and artist name as well as album art inside the receiver's on-screen display. Audio performance at the head of its class, thanks to a revamped ground and power supply pattern as well as meticulously selected and custom designed parts, such as the transformer and heat sink. 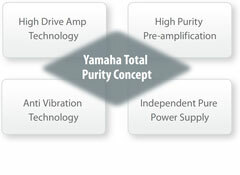 Features analog discrete amplifier construction, a low jitter PLL circuit and high power output. Other top-grade features include an aluminum front panel and large screw-type speaker terminals. A USB port on the front panel allows convenient connection of an iPod® and iPhone®, which also charges the iOS device when connected. Because the digital signal from the iPod and iPhone is transmitted directly to the AV receiver, there is no signal-loss or interference. You get to enjoy the best possible sound quality. 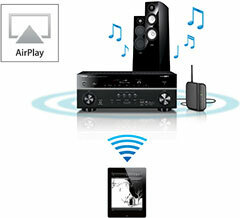 In addition, you can use the AV receiver’s remote control unit to operate the iPod and iPhone for basic playback control. Many live and classical albums have no gaps in the music. 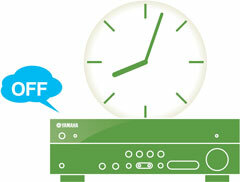 Gapless playback ensures that there are no pauses between audio files. This provides playback with no interruptions, the way it was meant to be heard. 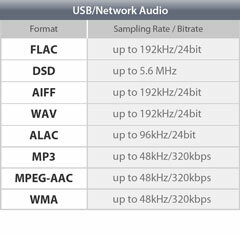 *Compatible with WAV, FLAC and ALAC file formats and input from USB / PC / NAS. YPAO™ (Yamaha Parametric Acoustic Optimizer) analyses the room's acoustics and measures various speaker characteristics, then calibrates the audio parameters to achieve optimum sound. Adaptive DRC automatically adjusts the dynamic range of the sound according to the volume level. 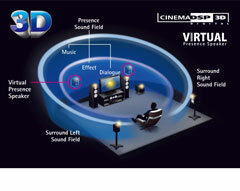 This ensures that you hear clear dialogue, vocals and sound effects at a comfortable level. There is no need to adjust the volume level as you listen; everything from whispers to big explosions will be heard clearly and comfortably at the same volume setting. It also tones down loud TV commercials and is ideal for low-volume, late-night listening, when you do not want to disturb others. 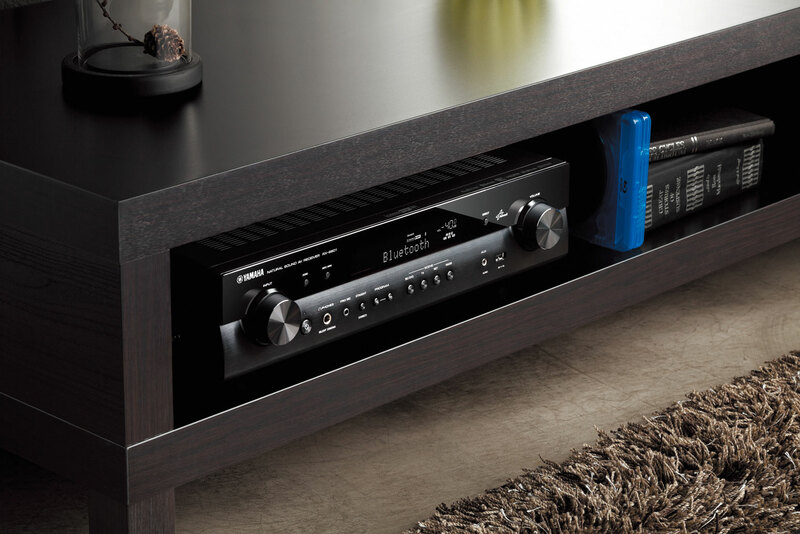 Auto Power Standby lets you save energy by automatically turning off the AV receiver's power after 20 minutes, two, four, eight or 12 hours.